BANGI, 27 October 2014 – More attention should be paid to socio-economic conditions which are changing rapidly due to the presence of new media in the form of various social platforms. Local human rights activist and scholar Datuk Dr Denison Jayasooria said the changes are also affecting the landscape of Malaysian politics. 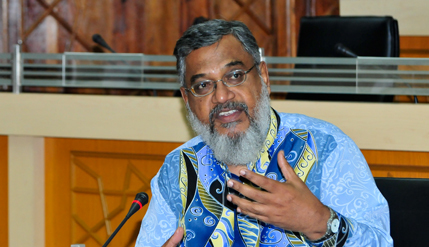 Datuk Denison, a principal fellow at the Institute of Ethnic Studies (KITA) in The National University of Malaysia (UKM) said the shift of public discourse was apparent especially after the 12th general elections and more so after the last general elections. He was speaking at the conclusion of a Roundtable Discussion on his views he wrote down in the book Faith and Society or Faith in Society: Our Future Challenge. “We have moved beyond ethnic or race-based discussions to inter-generational gap, rural-urban divide and so on”, he said. Members of the roundtable discussion, organised by KITA were Vice-Chancellor Prof Datuk Dr Noor Azlan Ghazali, Distinguished Prof Datuk Dr Shamsul Amri Baharuddin, Assoc Prof Dr Madeline Berma of the Faculty of Economics and Management and Prof K S Nathan of KITA. Friends, colleagues and academics of UKM agreed that he is a tireless advocate of the poor and deprived, but also a loyal friend and polite even to his critics. The 60-year-old Datuk Denison described the book as his life’s journey and thoughts about how faith and society became faith in society. Growing up in Banting, Selangor he was inspired in the Christian Methodist faith and eventually became a pastor. He transitioned to a non-governmental activist at MIC’s Social Strategic Foundation (YSS) where he aided the poverty-stricken – first, the Indians and later of other communities. In 2008 he became a principal fellow at KITA where he had since organised 66 roundtable discussions on national reconciliation and inclusive development. Prof Noor Azlan noted that Datuk Denison listed nine challenges in his book, linking social status to poverty and deprivation. The Vice-Chancellor congratulated the former pastor on his efforts to give back to a multi-cultural society. Prof Shamsul Amri – his boss at KITA – said the title of the book was intriguing as it suggested that Datuk Denison was optimistic that issues on religion and race will be resolved. Dr Madeline expressed admiration of Datuk Denison’s sophistication in fighting injustice through dialogue sessions and conferences, rather than protesting in the streets. “He uses the establishment and media to speak about advocacy. You are very much a ground person. He is embracing change. He does a lot of roundtable discussions,” she said. She also took the opportunity to urge academics not to sideline public social sciences. Prof Nathan, in turn said he was not surprised that Datuk Denison found the transition from NGO to academia at KITA to be smooth. “KITA is a living learning experience,” he said. It became the basis of Datuk Denison’s further research on poverty, based on need rather than race. The discussion was moderated by the Principal Research Fellow at KITA, Anis Yusal Yusoff.